Just when you thought you’ve heard about all the fun arts happenings Wilmington has to offer, something new comes to town! 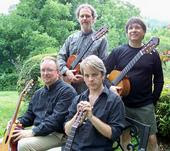 On October1-4, 2009, the city offers its very first Fringe Wilmington Festival, with a preview party on September 30. The festival will boast performance and visual art, as well as a 24-hour filmmaking competition. The presentations will take place at various locations, including The Baby Grand, OperaDelaware Studios, the Delaware Center for Contemporary Art, as well as other venues along Market Street. What is a Fringe Festival? The festival gets its name from one that started 1947 in Edinburgh, Scotland. Several alternative theater companies performed on the “fringe” of the Edinburgh International Festival, and a tradition was born. Today, fringe festivals can be found in New York City, Philadelphia, Cincinnati and Houston. These festivals offer opportunities for artists and performers to showcase material that might not be seen otherwise, because of its edgy, offbeat or “alternative” quality. 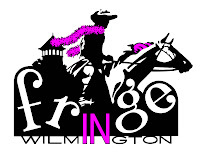 Some highlights of Fringe Wilmington include Robin Gelfenbien’s My Salvation Has a First Name, a Wienermobile Journey, OperaDelaware’s performances of “Black Horses” and “The Stronger” and Project Capoeira’s exciting Afro-Brazilian dances. Tickets for individual performances are $10 or less, and all-access packages are available starting September 1, 2009. Last week, I joined a small group of media folk to preview the Delaware Art Museum's summer exhibit, “Exposed! Revealing Sources in Contemporary Art”. What a treat! It was wonderful to hear the Curator of American Art, Heather Campbell Coyle, talk so enthusiastically about the pieces and the fascinating background information she amassed in her research for the show. First in our tour was the oldest piece in the exhibit: a 1964 offset lithography piece by Eugene Feldman entitled Friend's Wife (Mrs. JFK). The stark, grainy image grabs you, revisiting the raw emotion in the original Eddie Adams photo of Jackie O at Kennedy's funeral. As expected (and to my delight), there is a series of large Warhols lining the wall. 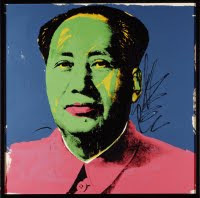 The seven colorful screenprints of Mao, 1972 come from a 10-piece portfolio. I've been enamored with all things Andy Warhol since I was a teenager (thanks to junior-high art teacher, Mrs. P.), so of course I was thrilled to see these extraordinary works, on loan from a private collection. They’re classic Warhol—irreverent, campy and powerful. Another piece that struck me was the enormous 60-piece Deluxe by Ellen Gallagher, an African-American artist whose expansive creation features the techniques of collage, laser etching, clay, and crystal embellishment, incorporated into ad pages of Ebony magazines from the 1960s. You could literally spend hours with this piece and not take in every meticulous detail. It is a breathtaking and brilliant commentary on culture, beauty and media imagery. Coyle’s favorite pieces include the Gallagher and a series by Richard Prince, based on pulp fiction nurse novels from the 1950s and 1960s. She noted that she enjoyed discovering the “backstory” to these artists’ inspirations, how they derived information and images from pop culture, poetry and media, and made it their own. “It adds a richness to the story if you know what the artist started with,” she said. You can also read Coyle’s blog on the exhibit at http://exposed-exhibition.blogspot.com/. Don’t miss this exhibit, on view until October 4. Starry-eyed aspiring actresses, an evil conniving villain, and an unlikely hero who saves the day: Thoroughly Modern Millie at the New Candlelight Theatre in Arden has it all. This rousing production, set during the 1920s, runs through October 10. The show is beautifully staged, choreographed and performed. Millie Dillmount, sung beautifully by a sympathetic Erica Scanlon Harr, is a small town girl following her dreams to New York City. Her odyssey lands her in a fleabag motel, which is merely a front for a “white slavery” ring funneling unsuspecting young women to Hong Kong via a laundry hamper. Micki Sharpe, who also directs the show, plays the hysterical, conniving Mrs. Meers, slipping in and out of her fake pigeon English when necessary. Bun Foo and Ching Ho, unwilling cohorts in her slave trade, are played by Reza Mirsajadi and Brian Peeke respectively. They are side-splittingly funny as they sing their numbers in Mandarin, with the subtitle translations overhead. As Millie’s dream of marrying her boss goes hopelessly wrong, she meets and falls in love with Jimmy Smith, played by the handsome and lithe Justin Damm. The wealthy Muzzy Van Hossmere is expertly sung by Jillian Pirtle. Megan Pisors’ portrayal of the slightly clueless Dorothy Brown is charming. As the big boss Mr. Graydon, actor Patrick O’Hara almost makes us want to like his bumbling, womanizing character. Be sure to see this heart-warming show, filled with snappy dance numbers, whirling secretaries’ desks and flapper dresses. The Brandywiners, a musical theater company now in its 78th year, presented “Camelot” on Friday evening, nicely staged by James F. Smith. This grand production, complete with full orchestra and colorful medieval costumes, graced the outdoor stage at Longwood Gardens. The company provides a stage for local amateur and professional thespians, while supporting civic organizations and charities through ticket sale proceeds. The orchestra, assembled and directed by C. Lawler Rogers, Sr. is stunning. The balance between the accompaniment and the cast is excellent, with each note from the pit precise and in tune. The actors do well with Lerner and Loewe’s bittersweet musical, which is sometimes heavy on the dialogue. The show’s hilarious, yet telling one-liners keep the first act light: Arthur asks Merlin why he has never taught him of love and marriage and Merlin chides, “Don’t scramble them together that way.” The second act becomes dark and brooding: a tale of betrayal and greed. The music, humor and quirky storybook characters keep the show engaging. Erin Cates plays a sympathetic Guenevere, singing with a clear, sweet tone. Guenevere’s “Before I Gaze at You Again” is one of musical theatre’s gems with its haunting melody and expansive phrases. Kudos to Ted Harding (Arthur) who reprises the role he did with the Brandywiners in 1981. Alexander Bowditch’s (Mordred) cuts through the stage like a knife with his confident and perfectly evil performance. He leads the men’s chorus in “Fie on Goodness”, one of the wittiest numbers in the show. In this number, we catch Broadway at its best and raunchiest, well before the “politically correct” movement made its presence known. One man sings, “When I think of the pleasures that earlier filled my life…Like the time I beheaded a man who was beating his naked wife”. In addition to its annual summer production, the group also performs concerts of Broadway and American music under the auspices of the Brandywiners Chorale.